Prehistoric animal fossil skeletons: American mastodon, mammut americanum, couple, the only mastodon couple on display anywhere. The Male (on left) mastodon, named the Buesching mastodon, was found near Fort Wayne, Indiana in 1968. The female mastodon, named the Owosso mastodon, lived 11,000 years ago and was found in 1944 on a farm in Rush Township, Shiawassee County, near Owosso, Michigan. This species lived during the Pleistocene Period, 2 million years ago, until 10,000 years ago over a range from Alaska to Central Mexico. 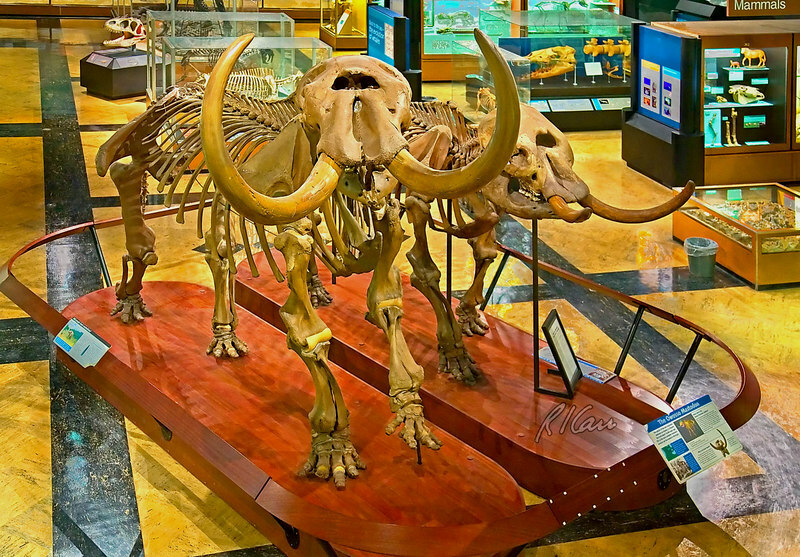 The mastodon became the Michigan state fossil in 2002. Museum of Natural History, University of Michigan, Ann Arbor, February 2006.